One of the oldest veterans in Seneca County, a man who served in World War II, turns100 years old today. Arthur Breidenbach, who was born on this day in 1919, said he was in the first draft of the war and had a pretty high number in the county, but he didn’t have to report until 1942 after it had started. Arthur’s son, Larry Breidenbach, said it was “a big secret” when he left for basic training and he wasn’t allowed to tell anybody where he was. “He sent souvenirs back home though so his parents knew where he was,” Larry said. Arthur said that after training in Puerto Rico, he went to Europe, and while he can’t remember where they landed, he believed they went in through France. He said the first night he and other soldiers were taken to get new Jeeps. While they “kind of got lost,” they finally found their way back to camp and drank that first night, Arthur said. He said it was the only time he got to drive a Jeep in the war. Arthur said they were given just one blanket and their pack and they had to lie on the ground. Larry said to this day whenever he gets cold, his father brings up his first night spent over there. About the middle of the night, Arthur said, they tore the side of a building off and started a fire. They got yelled at but made it until morning, he said. “It was so cold that first night in Europe,” Arthur said. He said he saw a lot of dead animals and people lying around in Europe. 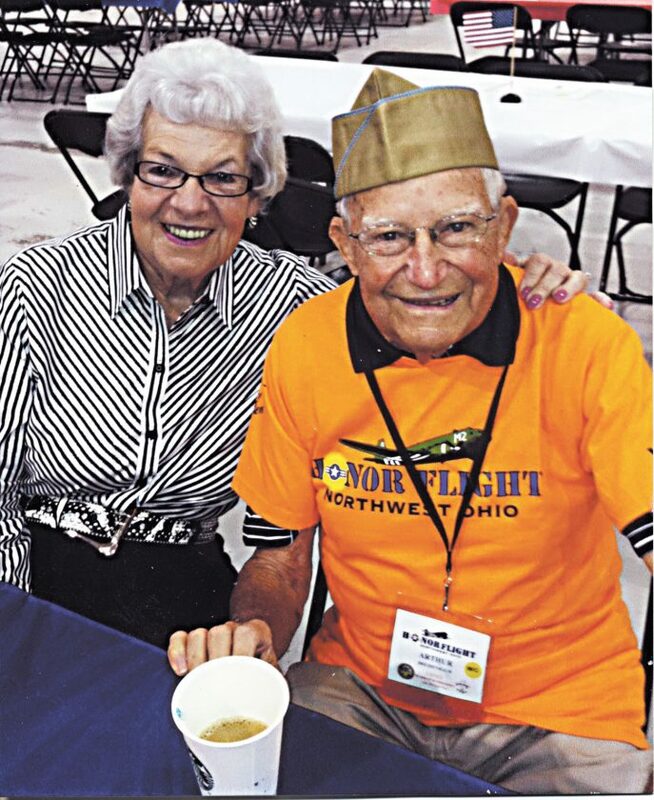 Arthur went on an Honor Flight in 2012 and he said that seeing the World War II Memorial “gave him goosebumps” and brought a lot of those memories back to him. He said shortly after being deployed to Europe, they saw these people who had a horse and a cow hooked to a wagon that were trying to escape. Also, Arthur said his family’s house burned down after he had only been gone for a month and two days. He said he tried to get out of the service in order to come home to help and his neighbors even wrote letters to try and bring him home, but he couldn’t get out. Larry said his dad was always behind the lines during the war. He said his father is happiest about the fact that he didn’t have to shoot anyone. While he carried a sidearm all the time, he never had to use it. Arthur said he remembered he laid his big rifle on a trailer and grabbed a newer carbine off “a person who didn’t need it,” which is what he carried with him the rest of his time in the service. While they trained with bigger guns that had bayonets attached during training in Puerto Rico, he never saw anybody use them during the war. Arthur was a chief switchboard operator in the U.S. Army Infantry and he earned a Bronze Star. Larry said Arthur earned the Bronze Star “for doing a tremendous job” and “keeping the lines open.” He said he was involved in the Battle of the Bulge. Arthur said he had to set up the switchboard and plug in the lines, and he helped set up lines when he was in Germany. “I had to hook the board up and the wires, and make sure it had operators on there. I had to get on the board sometimes too when there wasn’t enough guys,” Arthur said. He said for a while, they were on the move every day. They would bring guys forward with the switchboard and would have to set up more lines, and sometimes, he would have to carry it himself, Arthur said. Being on the move, they ate a lot of K-rations-daily food rations-and he said every day they’d get three boxes, which also included some cigarettes. “I traded cigarettes for money because I didn’t smoke. I would get a nickel or dime for a cigarette and there were three or four in a pack of K-rations,” Arthur said. Arthur also remembered how the prisoners of war cooked for them when the war ended. Arthur returned to the United States on leave and he was supposed to go back, but President HarryTruman had made the decision to drop the nuclear bombs in Japan and the war ended. However, Arthur said that he lost a cousin, Eldon L. Breidenbach, in the Pacific Theater. Arthur served from 1942 to 1945 and left the Army with the rank of technician fifth grade corporal when his service was finished. Arthur said when he and his friends got back and were completely out of the service, they partied and got “pie-eyed,” and his father didn’t make him stay in the field and work. Larry said before the war, Arthur had met his wife Marie (Zoeller), who was born May 2, 1923, when her family moved to a farm across the road from his farm. She was 7 and he was 11 when they first met, he said. Both from Tiffin, Arthur was one of seven children and Marie was one of 13 children, and they each attended a one-room school house together, Larry said. The couple was married June 6, 1946, had three children together and are to celebrate 73 years of marriage this year. Marie said she had always wanted a big wedding, and she got one. “The reason mom chose dad was because she knew how he was going to treat her. She knew she wouldn’t have to worry about that,” Larry said. Marie said she had worked during the war effort and got a job doing house work where she would clean houses for people. Later, she worked at General Electric, which is where she says she “made big money.” Arthur added that even though Marie worked 40 hours a week and he worked 55 hours, her paychecks were bigger than his sometimes. Larry said after the war, Arthur worked at Huth Construction Co. a little bit, which was located where American Standard was later. He said it was dirty out there and his father didn’t like that, so he went and worked for Seneca Wire some. Finally, Arthur got a job at National Machinery, which is where he worked for 34 years. Larry said his father also worked on a farm that he purchased and had bought a rental property. Arthur said at National, he worked on the floor putting big machines together and was asked to take over the electrical on the floor, which he did the last two years he worked there. “I liked that because I could plan my own work,” he said. Arthur’s daughter, Denise Walsh, said her father prayed every day during the war to make it through it. Arthur said often, the hood of a Jeep was the altar they used when they had Mass. Denise said after her father retired in 1979, Arthur became a daily celibate and started going to church every day, which he still does. Larry said his parents have seen a lot of changes in their lives, and they can’t get over how fast one can see pictures after they’ve been taken. Denise said they don’t use computers and the biggest changes in their lives is probably the technology. She said both her parents stopped going to school after the eighth grade because they worked from them on. Arthur said he worked on the family farm with his father because he didn’t want to go to high school. Marie said after eighth grade, she was asked by the teacher to help teach the first-grade kids, then she wouldn’t have to go to school. “That’s how I got out of high school, but now, I wish I wouldn’t have done that,” she said. The family credits the couple’s longevity to the pair staying active. Larry said their work ethic and being active and involved in the community has helped. Larry said after retiring, the couple went to Florida in 1980 which is where they stayed during the winter until about three years ago. He said they were involved in dances and talent shows and helped raise money for local parks and churches. “We walked every morning, four miles a day together, and then we went to church every day,” Arthur said. Denise said even before then, her parents had volunteered all throughout her childhood. She said Arthur was a member of St. Joseph Catholic Church, was an usher and also was a member of the Knights of Columbus. Larry said he was also a member of the National Machinery Quarter Century Club. Denise said with them both being Catholic, they had “a bunch” of godchildren, but they always gave all of them gifts for every holiday. “They both were very good about volunteering for other organizations their whole life,” Denise said. Larry said his parents made a lot of friends in Florida and have “led a simple life, but they had a lot of fun and played a lot of cards.” Denise said she believes the couple’s “faith and love for each other” has kept them together for so long. Marie said “it didn’t seem possible” that the couple had been together as long as they have. When asked for advice on how a couple can stay married this long, Marie and Arthur both laughed and their instructions were simple. “Don’t argue. Just give in,” Marie said. Arthur’s advice was even more succinct. “Just say yes,” he said.